We are accustomed to seeing Clinton supporters spread misinformation, ignore facts, and try to prevent those they disagree with from expressing their views. It is a shame to see some Sanders supporters using the same tactics. There are many valid sources of information about Hillary Clinton which are relevant to the campaign. There are also right wing sources which spread misinformation which Sanders supporters would be wise to stay away from. I recently found a Sanders supporter spreading bogus claims about Clinton, claiming that being on Coumadin should disqualify her from being president. The claims were written by Jerome Corsi, one of the writers who spread the Swift Boat Lies against John Kerry. The article they linked to was one of many on the same topic posted by him at World Net Daily. The source is a second reason for Sanders supporters to be skeptical.The article uses pseudo-science to make claims which are contrary to current standards of medical care. The source of the information is a quack physician who lost his license due to holding views which could jeopardize the lives of his patients. As both a physician and long-time Sanders supporter I attempted to correct this misinformation after it was reposted in the Progressive BERN Party Facebook group. Besides noting the medical fallacies in the argument and how untrustworthy the source was, I pointed out that if Sanders had a medical condition which required the use of such a medication we would be defending his ability to still be president. There are enough valid arguments against Clinton being president. There is no benefit in repeating bogus claims from the far right. This is true of this particular argument, as well as many others from right wing sources which are sometimes repeated by Sanders supporters. The reaction at the Progressive BERN Party Facebook group was to ban me from the group after pointing out the medical facts. That is certainly an intellectually dishonest and cowardly way to respond to being corrected on the facts. We might expect such thinking from Clinton supporters, and from Republicans. Unfortunately it is also seen in some Sanders supporters. Besides, if the goal is to really promote a new political party along the lines of Sanders’ views, and in opposition to Clinton’s views, what sense does it make to ban someone who has been promoting such views for quite a long time? Sanders supporters should be seeking to broaden their groups, not play games such as this. Going by the polls, there are two apparent front-runners for their party’s nomination, but one has a far more meaningful lead than the other. While I will not totally dismiss the possibility of Donald Trump winning the Republican nomination as I discussed yesterday, it remains far more likley that we will see multiple candidates take leads for a period of time in the Republican race as we saw four years ago. Perhaps we will know when Republicans are truly scared of him when they start to bring up his previous statements, including on abortion rights, health care, and support for how Barack Obama handled the economy. Hillary Clinton has a more significant lead in the Democratic race, and going by any conventional measures is most likley to win, but she is showing some signs of weakness which no longer make her nomination appear inevitable. 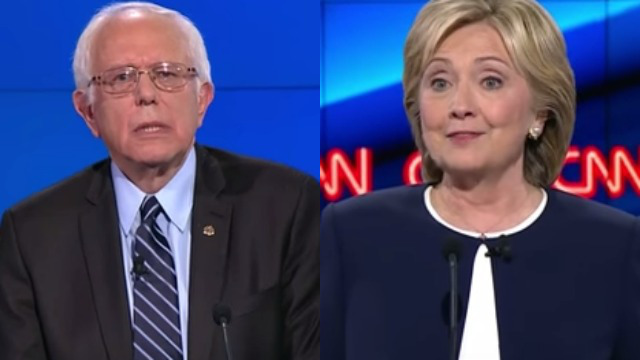 The survey offers a series of warning signs for the leading Democratic candidate. Most troubling, perhaps, for her prospects are questions about her compassion for average Americans, a quality that fueled President Barack Obama’s two White House victories. Just 39 percent of all Americans have a favorable view of Clinton, compared to nearly half who say they have a negative opinion of her. That’s an eight-point increase in her unfavorable rating from an AP-GfK poll conducted at the end of April. The drop in Clinton’s numbers extends into the Democratic Party. Seven in 10 Democrats gave Clinton positive marks, an 11-point drop from the April survey. 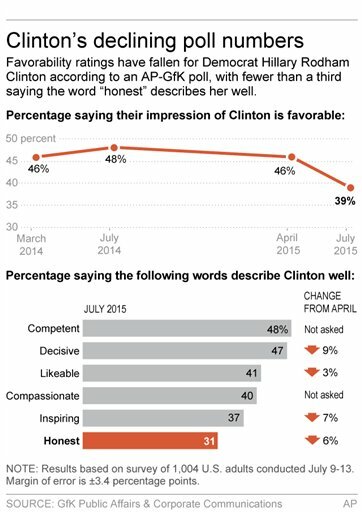 Nearly a quarter of Democrats now say they see Clinton in an unfavorable light. While Clinton’s favorability rating fell, Obama’s stayed constant at 46 percent since April. More than 8 in 10 Democrats have a positive view of the president. Few voters say they trust former Secretary of State Hillary Clinton, but a majority say she has a vision for the future of the country, according to a new survey that highlights the challenges ahead for the Democratic front-runner’s campaign. The Morning Consult poll of 2,019 registered voters shows just 19 percent say Clinton is honest and trustworthy, and only 35 percent say she has the average American’s best interests at heart. Should Clinton win the nomination, trust issues are likely to be a greater factor in the general election. Democrats are quicker than the full electorate to ignore the scandals, and many are not paying attention to the details. Republicans are likley to bring them up far more in the general election, similar to how the Swift Boat attacks on John Kerry surfaced prior to his winning the nomination, but the major attacks were held until shortly after the Democratic convention. The scandals involving Hillary Clinton’s email and contributions to the Foundation also threaten to be more damaging as, in contrast to the Swift Boat Liars, the accusations against Clinton are supported by the facts (including newspaper fact-check sites). But after a flurry of unflattering stories regarding her email practices during her tenure at the State Department and questions about possible conflicts of interest with donors to Clinton-related foundations and groups that paid her husband, former President Clinton, speech honoraria, the share of Americans who picked “is honest” dropped from the mid-70s to just 42 percent in the May CNN/ORC poll, with “not honest” jumping from the 20s to 57 percent. The ABC News/Washington Post poll also recorded an honesty drop, albeit a less precipitous one. When asked if Clinton is “honest and trustworthy” in March, Americans were evenly split—46 percent answered yes, 46 percent responded no. By May, those numbers had stretched to 41 percent yes and 52 percent no. So will these doubts about Hillary Clinton’s trustworthiness cost her the election? There is no doubt that voters want to be able to trust a president, but it should be remembered that Bill Clinton won an election in 1992 with large deficits in the honesty department. Polling by CBS News and The New York Times in April 1992 found that, when asked if Clinton has “more honesty and integrity than most people in public life,” just 16 percent of respondents said yes, while 48 percent answered no. The ABC News/Washington Post poll also reflected concern about Bill Clinton’s integrity. In June, when ABC/Washington Post polled the statement “Clinton is honest,” 39 percent agreed and 49 percent disagreed. In October, the numbers were virtually even, at 31 percent yes, 32 percent no, hardly a rousing endorsement of his integrity, yet he beat the incumbent President George H.W. Bush anyway. Still it would make sense to chose a candidate who is trusted by the voters going into a general election campaign. Of the $47.5 million that Mrs. Clinton has raised, less than one-fifth has come from donations of $200 or less. That is a far smaller proportion than that of her Democratic and Republican rivals who have excited grass-roots donors on the left and right, such as Senators Bernie Sanders of Vermont and Ted Cruz of Texas. While Mr. Sanders raised far less than Mrs. Clinton over all — about $15 million, including money transferred from his Senate account — about four-fifths of that amount came from smaller donors. Total contributions is probably the more important factor with regards to winning elections, but this gap might also indicate that those who support Clinton in the polls are also less enthusiastic about turning out to vote in primaries and caucuses. Despite the idea that corporations are people, it takes real voters and not corporate donors turning out to win primary elections. Clinton also got the first major union endorsement, but there has also been grass roots opposition to the recent decision by the American Federation of Teachers to endorse Clinton. While Clinton has a tremendous lead for the Democratic nomination at this time, she also has significant weaknesses which could still influence the outcome. The contrasting campaign styles of Clinton compared to Sanders and O’Malley, along with other potential candidates entering the race, could impact the opinions of those who now state they support Clinton, largely based upon a combination of name recognition, nostalgia, and gender. The increased disqualification we are seeing with the status quo could lead to unanticipated results. As I have discussed previously, polls at this stage have very limited predictive value with regards to the ultimate election results. Patrick Egan looked at various polling data and found only one which appears meaningful in predicting election results–presidential approval. While this is based upon a limited number of elections, and other factors certainly could impact the final election results, Obama’s improving popularity in some (but not all) polls should be encouraging for Democrats going into the general election. Update: The Clinton campaign is right to be happy with their lead in the polls and the money they brought in. It is also not surprising that they are ignoring the polls showing that people do not trust Clinton and do not care about where the money is coming from or who Clinton is indebted to. In a stunning development one day after the release of Where’s the Birth Certificate? The Case that Barack Obama is not Eligible to be President, by Dr. Jerome Corsi, World Net Daily Editor and Chief Executive Officer Joseph Farah has announced plans to recall and pulp the entire 200,000 first printing run of the book, as well as announcing an offer to refund the purchase price to anyone who has already bought either a hard copy or electronic download of the book. If they had only taken the same action when it turned out that the claims of the Swift Boat Liars, including Jerome Corsi, was also based upon factual inaccuracies. for those who didn’t figure it out yet, and the many on Twitter for whom it took a while: We committed satire this morning to point out the problems with selling and marketing a book that has had its core premise and reason to exist gutted by the news cycle, several weeks in advance of publication. Are its author and publisher chastened? Well, no. They double down, and accuse the President of the United States of perpetrating a fraud on the world by having released a forged birth certificate. Not because this claim is in any way based on reality, but to hold their terribly gullible audience captive to their lies, and to sell books. This is despicable, and deserves only ridicule. That’s why we committed satire in the matter of the Corsi book. Hell, even the president has a sense of humor about it all. Some more serious reporting from us on this whole “birther” phenomenon here, here, and here. Update: Jerome Corsi, who is making a living by lying and smearing people, is now upset that Esquire posted a false story about him and is threatening to sue Esquire. The difference is that Esquire admitted their story was a parody while Corsi continues to spread his lies. It’s a perversion of democracy, indeed, when individuals like the Kochs have so much clout while the many millions of ordinary Americans have so little. What the Kochs want is coming to pass. Extend the tax cuts for the rich? No problem. Cut services to the poor, the sick, the young and the disabled? Check. Can we get you anything else, gentlemen? The Koch brothers have been the target of many liberal bloggers lately. I agree with criticism of them for matters such as their pollution record, criticism of the increased concentration of wealth among the ultra-wealthy, and criticism of a system which allows small numbers of wealthy people to have so much power. I do not object to the fact that they are spending money to promote their views (if you can look beyond the other areas of criticism). Personally I wouldn’t mind if we had more wealthy individuals spending money promoting democracy and true freedom. What is really amazing is the number of libertarians who see the Kochs as promoting liberty as opposed to oligarchy. This leads to one of the reasons our democracy is in trouble–many on the right confuse limitation of government with liberty. In an era where there are many powerful forces, a liberal government is often essential to preserving liberty for the individual. On the other hand, we must also be vigilant in preventing government from infringing upon our liberties. Here, far too many people on the right look the other way and advocate increased government action where it does not belong while complaining about legitimate actions of government. In any discussion of the dangers to our democracy, we must include the importance of an informed electorate. The conservative dominance of the news media helps create the problem of people who see people like the Kochs as supporting rather than threatening freedom and democracy, along with the many falsehoods common on the right which I have discussed in multiple other posts. How can voters intelligently access health care reform when right wing media outlets are making false claims about death panels, job killing, and a government take-over of health care? How do voters evaluate proposals to deal with climate change when the right wing noise machine spreads the propaganda of the petroleum industry? How do individuals assess the candidates in a democracy when, hearing the false claims of the Swift Boat Liars and Birthers, along with distortions of the actual beliefs of liberal candidates? During his campaign, Obama clearly said that an economy that took eight years to break couldn’t be fixed in a year, that Afghanistan was a graveyard of empires and would not be an easy venture for us. Candidate Obama didn’t feed us happy talk, which is why we elected him. He never said America could solve our health care, economic and security problems without raising the deficit. Instead, he talked of hard choices, of government taking painful and contentious first steps towards fixing problems that can’t be left for another day. Right after Obama’s election, we seemed to grasp this. We understood that companies would be happy to squeeze more work out of frightened employees, and would be slow to hire more. We understood that the banks that had extorted us out of billions of dollars, were lying when they said they would share their recovery. We understood that a national consensus on health care would not come easily. Candidate Obama never claimed that his proposed solutions would work flawlessly right out of the box, and we respected him for that. But today, the president is being attacked as if he were a salesman who promised us that our problems would wash off in the morning. He never made such a promise. It’s time for Americans to realize that governing is hard work, and that a president can’t just wave a magic wand and fix everything. Compared to the nasty and dishonest letters from Obama haters, typically repeating the same lines, this is extremely tame. Many conservative bloggers are claiming that this is being sent out by the White House without any evidence to back up their claim. This is probably yet another baseless conservative conspiracy theory. Besides, I wonder how many of them were upset when the false claims spread by the Swift Boat Liars were eventually tracked back to Karl Rove’s misinformation operation at the Bush White House. My bet is that this is one of a large number of Obama supporters who is acting on her own. We have seen many examples of individuals working to support Obama since there was first talk about him running for president. It is not necessary for the White House to send out letters. There are plenty of Obama supporters who regularly do so on their own. In a Sunday morning e-mail to The Plain Dealer, Light denied speculation that she’s actually President Obama, his wife, Michelle, or National Security Council member Samantha Power. “I’m flattered, and I must give the Tea Partiers credit for even knowing who [Power] is,” Light’s e-mail said. “But what I want to point out is that, if I were a person trying to imply this huge groundswell of support for our beleaguered president, then I would have signed the letter with different names. However, as you may have noticed, my main point is that absence of support for the president. Representatives of the White Houses media affairs office did not respond to requests for comment on Sunday. “I think there’s only one reason why an editor publishes something in his or her paper: because they think it is going to be read,” Light’s e-mail said.